A host of well-known figures from national and local government, parliament, sport, the arts and the media joined University governors, staff, students, alumni and representatives of the local community on Thursday 1 November at the Purcell Room in the Southbank Centre for a celebration to mark the installation of Sir Simon Hughes as the new Chancellor of London South Bank University (LSBU). Simon Hughes has been appointed to this honorary position for a four-year term up until 2022. He takes over the role from Richard Farleigh, who is standing down after serving the University for a six-year period since 2012.
Notable figures present at the ceremony included the UK’s most successful female Olympic athlete and rowing gold medallist Dame Katherine Grainger, popular children’s TV presenter and Liberal Democrat peer, Lady Floella Benjamin, and TV presenter Anthea Turner. Three choirs performed during the ceremony: a Welsh choir, ‘Cor y Boro’ (Borough Chapel Choir) sang ‘Calon Lan’ (‘A Pure Heart) by Daniel Jones; LSBU’s staff choir, the LSBU Singers, performed The Kinks’ ‘Waterloo Sunset’ and Grace Notes, a student choir from Bacon’s College in Rotherhithe, sang ‘Colours’ to words from iGospel. Former Southwark MP for more than 30 years, Sir Simon Hughes met with a standing ovation following a sincere and moving acceptance speech, in which he said he had been a ‘huge enthusiast’ for the University for 35 years and pledged to bring that enthusiasm to the role in a big way. 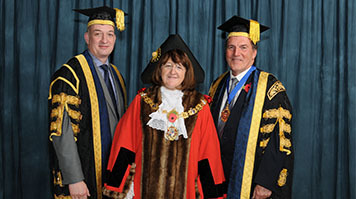 Simon promised to forge stronger links between LSBU and other universities in the three other capital cities of the UK and with the other 27 capital cities of the EU. Simon said that under his chancellorship he hoped LSBU would revive the tradition of an annual public South Bank lecture on a topical subject by an eminent speaker; he expressed a wish to build on LSBU’s existing relationships with local colleges, schools and other education and skills providers; and to promote to everyone in Southwark the education and training opportunities available locally. Simon Hughes said:“Our job is to open all the doors of study which lead to places of employment. Our job is to continue to set thousands of people on the road to opportunities and their chosen paths for fulfilment and success. Our job is to equip students of today and tomorrow with the academic, technical, emotional and mental strength to survive the challenges of life and make the greatest contribution. “I have no doubt that Simon will be able to achieve all that he has promised by using his great energy and expertise and I look forward to working in partnership with him to generate the very best opportunities for our students. Read more about Simon Hughes' appointment as LSBU’s Chancellor.